- Initial stable release. Using SDL with omapdss framebuffer. - Default settings for OpenPandora, see .zesaruxrc file on appdata folder. - Fixed correct aspect ratio. 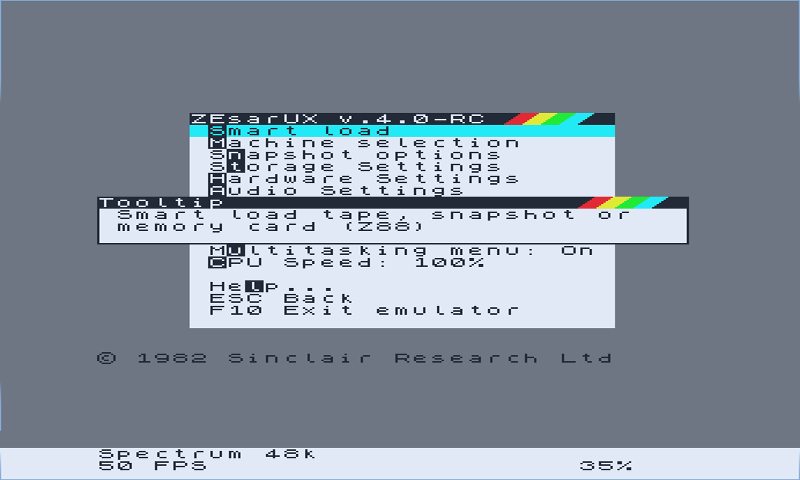 - Added --disableborder and --zoom 3 by default to .zesaruxrc config. - Added Festival-lite, female english voice and sox. - Changed Default configuration, delete .zesarux and omapsdl.cfg files on appdata/zesarux folder, for new changes to take effect. - Changed default zoom to 2. - Latest stable release. Updated libs and sources. - Make ZX-UNO default emu. ROM and MMC copied at first start to appdata folder. - Flite config files restored. Text to Speech works again. - Changed default config. It would overwrite the current one the first time only. - Fixed permission files on share/zesarux folder. - Latest stable release. See Changelog above. Fairly complete options. All Spectrum types can be selected. Once, when Tapeloader was active, the F5 menu appears a the bottom, making it very hard to select something. Spellbound 128 managed to hang the emulator. ZX48 games worked allright (tested BruceLee). Emulation is smooth.